This was one of the longest days and I am beat. Probably one of my worst travelling days. I wrote about the fan belt problem I had on Sunday afternoon, four weeks ago. Just north of Ft. Lauderdale I pulled off to the side of the ICW and anchored there until Tuesday morning. The owner of a nearby anchored power boat came to my rescue and ordered a new belt but it would not have arrived until between April 4 and 10. Greg Clark managed to deliver two belts to a close by address on Monday, but it barely fit and I wanted to replace it with the slightly longer belt my new friend, Herly, has received by now. I was on standby with a buddy pass to arrive this late afternoon at the FLL (Ft. Lauderdale) airport. Herly graciously offered for me to stay with his family overnight and then I would be on my way to the boat on Monday, tomorrow. But when I checked the space available for the Sunday morning departure I decided to take the Saturday red eye flight. I managed to get a premium seat with decent legroom and manage to sleep a few hours of the 5 1/2 hour flight. I had reserved a $35 one way rental car at the FLL airport because public transportation is very sketchy. I went up to the Enterprise Rental desk at 7.30 a.m. and inquired if I could leave my backpack there. No, and I was told there is no short time storage facility at the airport. What to do? Herly would not come back from a weekend in Miami until the evening. I wanted to attend the 8.30 am mass at Saint Sebastian, where I had such a warm reception on April 2nd. I swung the heavy pack, filled with books, back on my back. I did not want the car any earlier than the late afternoon to avoid paying an extra day. At the airport information desk I learned that there was indeed a storage possibility, but it did not open until 9 am. That done I took a local bus and attended the 11 am service at St. Sebastian church. 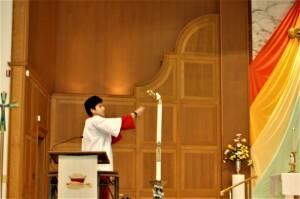 It was their confirmation service. I counted twelve confirmandi, mostly young adults. It was such a treat to see these young men and women become full members. The bishop officiated and I would have liked to show you a few pictures of the ceremony and the bishop’s miter. But my battery went dead after this test picture. This coming June 4th, on Pentecost Sunday, my youngest daughter, Jeannine, will be one of the confirmandi in her parish, Sacred Heart, in Norfolk, Va. and I am super proud and blessed that she chose me as her sponsor. This date fits right in with my schedule for my planned summer trip up the Atlantic Coast. Her older sisters were confirmed in 8th grade when they attended St. Patrick school in Tacoma, Wa. Just before the service I received a text from Herly that something had come up that retains him in Miami until Monday evening. So, we arranged that I would swing by his home and pick up the belt on my way directly to the boat in Vero Beach. But when I cam back to Enterprise car rental I had an unpleasant surprise. I needed to have them swipe my credit card. My credit card is in my wallet which I forgot to bring with me when I flew to the NW on April 8th. I had cashed extra cash to use in Cuba and I had my checkbook and any online purchases did not necessitate a card in those three weeks in the NW. I had given my credit card details when I reserved the car. Another search on the internet did not come up with a way to get to Vero Beach to day by public transport. I spent $25 on a taxi ride from the airport to the Tri-Line rail station. The rail ticket was only $5 to West Palm Beach. This got me a lot closer to Vero Beach and I was hoping that there would be an airporter or local public transportation to get me closer to my boat. I was told by the train and local bus drivers, no but when I asked one more uniformed man, he pointed across the tracks to a Greyhound bus. I yelled to the driver if he was going north which he confirmed. I yelled back: “I am coming”. Swung the heavy pack on my shoulders again and rushed up over the overhead bridge to the other side. When I got to the ticket counter I was told that they had closed the computer. This bus would have brought me to within an affordable taxi ride from either Fort Pierce or Melbourne. Now I had to take a $25 taxi to a $79 motel to get with another $25 taxi ride on a $30 Greyhound to Vero Beach to morrow morning. I am not yet in the mood to use my cliché: “God must have not wanted me to rent that car”. But the lesson learned is: Get a second or third answer to questions like the existence of the baggage storage and the available bus services. Now on a much better day this last week: I spent a very enjoyable evening giving a presentation at the Seattle Yacht Club on Thursday. The turnout was very good and I managed to sell a good number of both “SoloMan” and “The Mastmakers’ Daughters”. It was done on short notice but very well organized and promoted. The last blog was upon arrival in the Northwest from Florida, on April 8th. Time flew, I’ll be flying back the end of this week. The Easter experience in Holy Week was again a high light, this year at St. Theresa church in Federal Way, within walking distance to Rose Marie’s home. 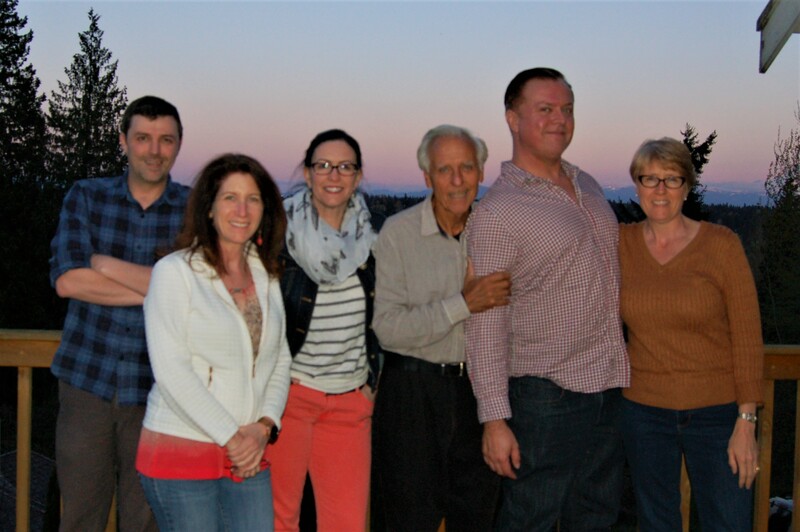 The Saturday before Easter, we had a family reunion at the home of my oldest daughter, Lisa. All my five children were present. For the first time since John and Jens’ wedding in 2014. L.R. : Seth 1980 Portland,Or. Lisa 1964, Rose Marie 1968, me, John 1971 San Diego, Ca., Jeannine 1969 Norfolk, Va.
On Easter Sunday I was privileged/blessed to sit between Rose Marie and Jeannine in the mass of the Resurrection. All worked out well. Everyone had a chance to catch up. I am in Gig Harbor, staying with friends Bob and Jackie Ellsworth. Yesterday, in church I caught up with many of my parish friends at St. Nicholas. This morning I met the Spanish students of Adam von Zimmermann at the Gig Harbor High School. Adam was my dock neighbor when I lived on the boat in Arabella’s Landing Marina. 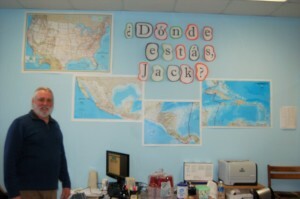 His students have been following me on my satellite tracking, web blog and videos. We attempted to have regular Skype video calls but wi-fi turned out to be too weak and my schedule too irregular to continue the first attempt. This photo shows how Adam and his classes have been tracking my progress. My new 100 odd friends had lots of good questions and comments. Adam shot some video footage and I shall have clips or stills from it on the next blog. Depending on the space available on my buddy pass, I will arrive early morning or early evening Saturday the 29th in Ft. Lauderdale and continue my trip from Vero Beach to Green Cove Springs, Fl. The program starts shaping up for my trip north. On June 4th, Pentecost I will be Jeannine’s sponsor when she is confirmed in Sacred Heart church in Norfolk, Va. I’ll get a chance to visit with my 2nd oldest grandson who is incarcerated in Portsmouth, Va. and see his two daughters, my great granddaughters, and my grand-daughter in law. On the 1st of July I will give a presentation on my circumnavigation at the Mystic Seaport, R.I. Wooden Boat Show. Then I plan to join the cruise of the OCC (Ocean Cruising Club) Southern New England chapter to watch the 4th of July fireworks in Bristol Bay, R.I.
Wednesday April 12. Videos of the sail from Panama to Cuba. I finally managed to upload to Youtube. It requires a telephone, which I did not have until back in the USA and I have a fast internet connection now, at my daughter’s home. The Jungle near the Shelter Bay Marina. A fast sail from Montego Bay, Jamaica to George Town, Grand Cayman. A party of us sailors and the staff at the outpost immigration/custom and marina people at Cabo San Antonio on the SW corner of Cuba. Palm Sunday April 9, Back home in the NorthWest. 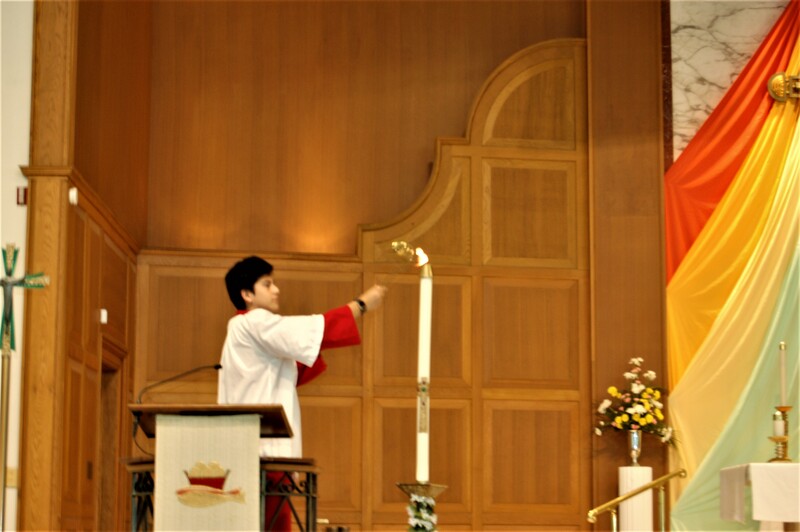 That Sunday Morning, a week ago in Fort Lauderdale, I attended mass at St. Sebastian Church. The last time I had been able to attend mass was in Montego Bay, Jamaica on February 26th. The weather had made it impossible to get to shore in George Town, Grand Cayman and I was underway on a couple of the Sundays, no churches in my last two Cuban Sunday stops. That is probably about the longest period in my life that I missed a Sunday service. The other period was the 28 day 3000 miles transit from Santa Barbara to the Marquesas in May 2005. But the service at St. Sebastian was worth the long dry spell. Father Jim reminded me of Father Gary Weisenberger, the priest who served for a long period at St. Nicholas my home parish in Gig Harbor. Godly men with humility and great wit. One of the first questions Father Jim asked: “Which visitor came from the farthest away?” The Northwest is about as far as you can go from Fort Lauderdale. My hand shot up. 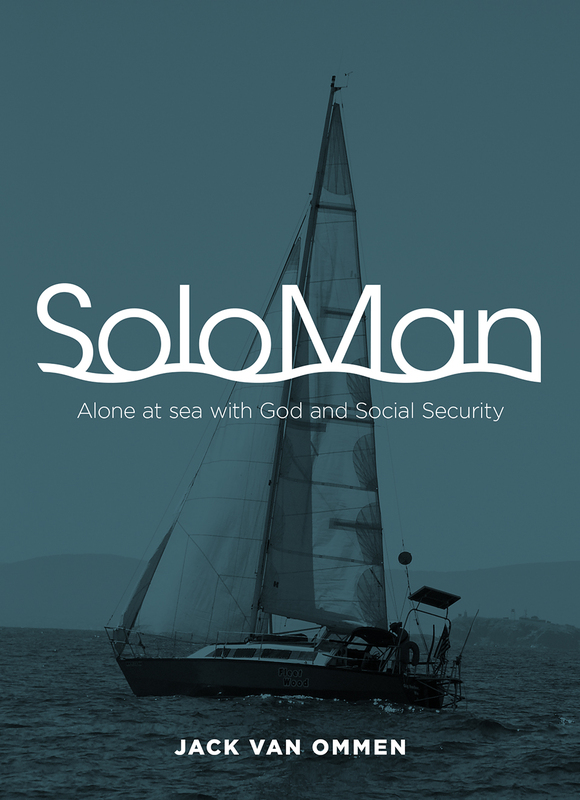 I got to tell the whole church that I had just finished my circumnavigation and that the subtitle of “SoloMan” was “Alone at Sea with God and Social Security”. A roar of laughter went up. I got to give a way a lot of my boat cards with the books info on it. And afterwards I made some new friends at the Kaffeeklatsch. I paid my $145 one night moorage at the Bahia Mar YC, that is the most I ever paid for one night moorage, in 2012 I paid $90 at a very fancy yacht club in Valetta, Malta. I left in the afternoon on the ICW headed for West Palm Beach. But after the second of 19 bridges, I noticed steam in the exhaust, overheating. 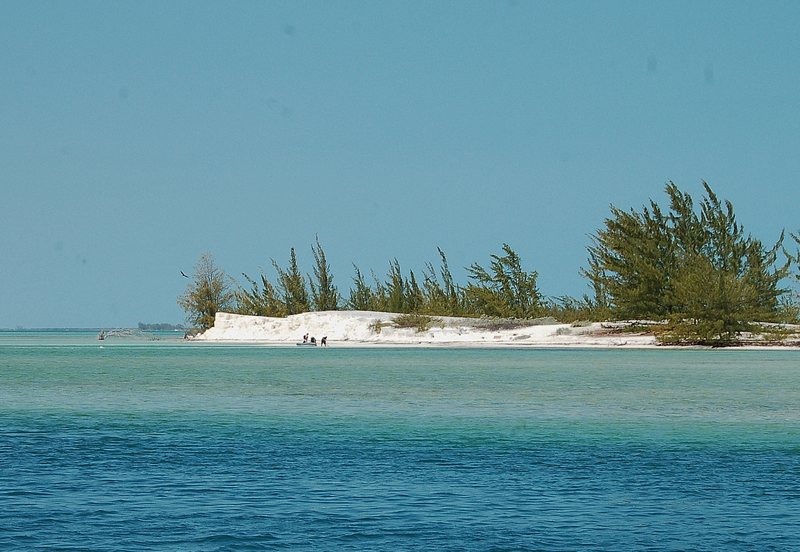 I happened to near a bay off the ICW next to the Coral Reef YC, I dropped the anchor. I cleaned out the cooling water intake and then noticed that the fanbelt was damaged and ready to break. I had no spare aboard, a definite overlooked part of my preparations. I hailed a power boat anchored nearby for the Sunday afternoon family outing. Herly, a Brazilian-American took the details down of the belt and we measured and photographed the belt. The next morning he phoned to tell me that he had found the belt and that it would arrive between April 4 and 10. Then I called Greg Clark who managed to have two belts delivered to the nearby Sunrise Marina, where he knows the management. I rowed over and installed the belt. It was too short but I managed to make it work. That Tuesday evening I anchored out near the yard where Greg and Marlys were on the yacht they work on. I spend the evening with them, caught up on each others experiences and future plans. Marlys fed me a delicious dinner. Wednesday morning I chose to sail outside on the Atlantic out of Palm Beach to Fort Pierce. The forecast was for 10-15 knot from the south. I started out with my full main sail. The wind strengthened and I had to put in the two reefs. Next the main came down and I set the 90% jib. I was still doing between 5 1/2 and 6 plus knots. By the time I approached Fort Pierce I had taken down the 90% jib and sailed just under the small storm jib. By then the wind had strengthened to around thirty knots. I was surfing on the wild waves. I was getting very nervous on entering the Fort Pierce inlet. Fortunately the fast sail had guaranteed me a day light arrival. My greatest fear was that I would be pushed beyond the entrance and then it would be another night at sea and the the wind would change to a strong Northerly which would be a dangerous and very uncomfortable situation. Thank God I managed to steer the boat between the breakwaters at 5.30 p.m. I was exhausted and dropped the anchor at the first opportunity. It was still blowing with 25 knot gusts but the water surface was relatively flat. 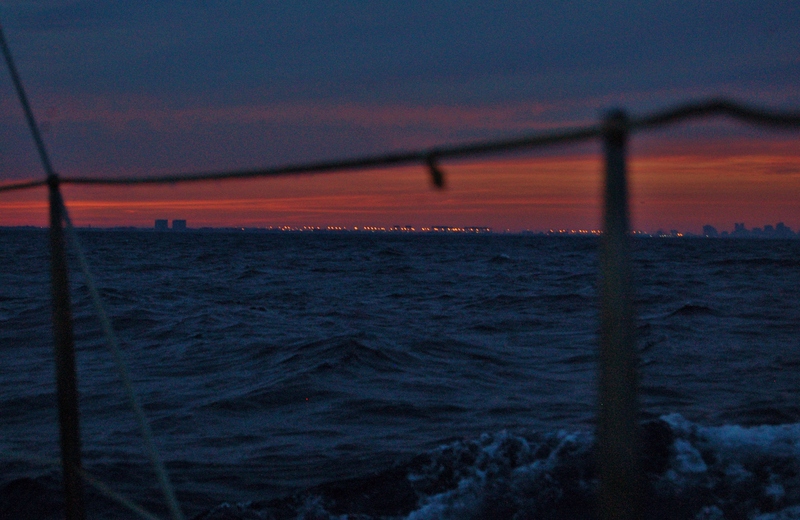 But just before dark my anchor started dragging. I managed to re-anchor and get a better set in shallower water. But since I was still close to the ocean inlet there was a two plus knot current. 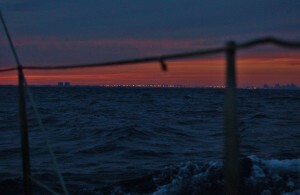 In the morning my rope anchor rode was wrapped around the keel. This has caused me a great deal of trouble in the past where I had similar current issues. This time I learned a new trick. I managed to steer the boat out of the wrap. On Thursday I had just one opening bridge at Fort Pierce and a lomg stretch without any bridges and then in Vero Beach two fixed bridges with 65 foot clearance. I sailed most of the way since the wind was still from the south. A ferocious thunder storm dumped bucket loads and I was soaked through and through, the visibility went to about a 150 feet. The engine started overheating again. I anchored off the ICW in shallow water. I had hoped that it would just be a clogged cooling water intake filter to be cleaned. But I ended up having to remove the fan belt to get to the water pump. But after all that work there was nothing wrong with the pump impeller. I motor sailed the rest of the way at slow throttle. I hope that the longer belt Herly has by now and which I expect to pick up on my return to Fort Lauderdale the end of the month will solve the problem. But if it does not I may have a major engine problem. “Fleetwood” is now on a mooring buoy in the Vero Beach Municipal Marina. This is quite affordable at about $15 per day. The marina moorage is about $56 per day. It is a very nice facility in a beautiful location. Brian, a new friend I met at the marina drove me to the airporter stop on the main north-south highway, with which I reached the Orlando airport and managed to get the very last seat on my stand by buddy pass to SeaTac on Friday. I am settled in with my #2 daughter Rose Marie and her husband Donovan in Federal Way. Quite a change from 70 to 80 plus Fahrenheit to socks and heated homes. I will look after their three cats while both are business travelling this week. This Easter weekend we will have a family reunion and celebrate my February 28th eightieth and three more April birthdays of the family. St. Theresa church is within walking distance, I attended Palm Sunday service and will do all the Holy Week services there. Then I plan to be in Gig Harbor at Saint Nicholas on Sunday the 23rd. The famous Mug Race on the St. John s River is held the weekend of May 5th and I’d like to participate. The finish and party is at the Green Cove Springs Marina near Jacksonville, Florida, where I plan to do a thorough haulout. This means I need to be back in Fort Lauderdale before April 30th. 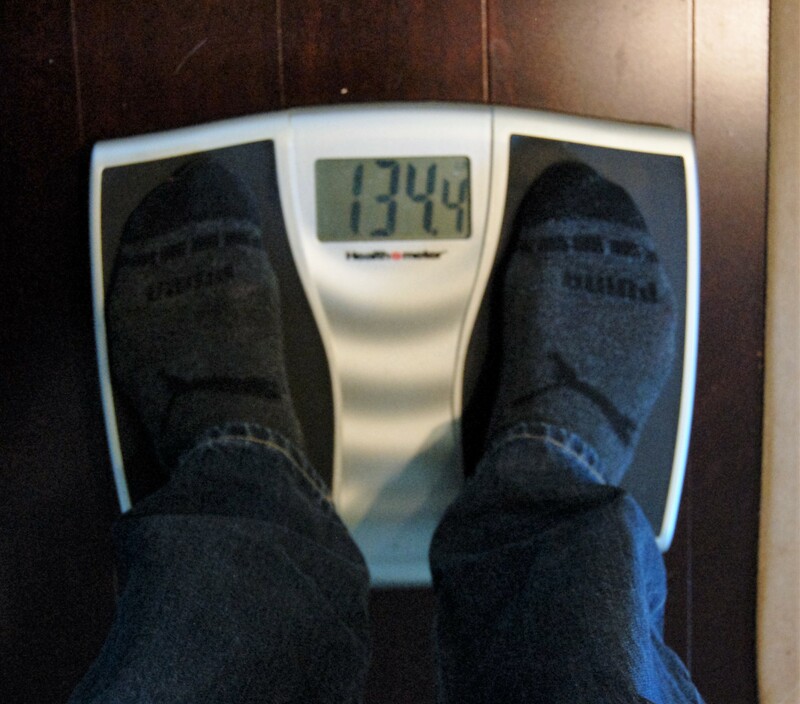 I am back to my teen age weight. 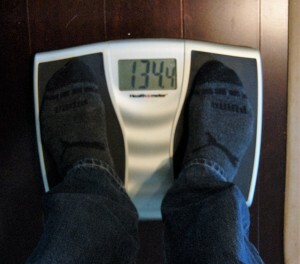 132 Lbs/60 kilos, without the Nikon camera. Ocean Sailing is the best way to control your weight. April 1 Around the World at Eighty years. This is not an April fool`s joke. Though it all started as a joke when I headed up my E-mail mast head with “Around the World before Eighty Years”. That was in 2005, when I was 68 year young punk. Then in December I realized I was not going to make my deadline and changed into “At 80 years”. I am happy to inform you that the quest is over. Yesterday, March 31st, I crossed the very same point on the 80th Longitude West in the Florida Strait where I sailed on exactly the same day in March 2009 on my way back from a winter`s cruise in the Caribbean. In 2007 I had sailed further east of the 80th Longitude West on my way from the South Atlantic via Brazil and Trinidad to the Chesapeake Bay. That same summer of 2009, I crossed the North Atlantic and spent four years in Europe and on the way back to complete my circumnavigation through the Panama Canal, I lost my first Fleetwood near Ibiza on November 16, 2013. Most of you know the details but some are new to the story. At that moment I thought my story had come to an end and I started writing “SoloMan”. But back for a visit to the North West I found a copy of Fleetwood at a very affordable price and decided to complete the circumnavigation, backwards. I celebrated my 80th birthday on February 28 while sailing from Montego Bay, Jamaica to George Town, Grand Caymans. The plans to celebrate my birthday in San Diego went awry. Now we have a new plan. I will celebrate it right after Easter in Tacoma/Federal Way with my two oldest daughters and Jeannine will fly from Virginia and my two sons will come up from Portland and San Diego. Lisa and Jeannine have their birthdays on April 18 and 11 respectively. My new plans: I plan to sail up the US Atlantic Coast and like to try one of the “Great Loop” routes into the Great Lakes and then come down to the Caribbean again via the Mississippi this late Fall. I need to do some maintenance and cosmetic upgrades to the boat and plan to do this in the same place where I did this in 2008 and 2009 in Green Cove Springs on the St. Johns River south of Jacksonville, Fl. then also hope to spend some time in the Portsmouth, Va. with Jeannine, David my grandson and my two great granddaughters. Time for some sailing lessons. I found a decent rate to leave Fleetwood on a mooring for a month in Vero Beach, a 100 miles north of here on the ICW. Where I hope to visit with dear friends I met in Green Cove Springs in 2008, Linda and Ron. And I expect to visit with Marlys and Greg Clark who are 35 miles up the ICW in West Palm Beach where their employer has his mega yacht in the yard for a short service. I arrived in Ft. Lauderdale also on April 1 in 2009 and spent several wonderful days with Marlys and Greg when Greg was in command of an other mega yacht. For my birthday they presentd me on April 1 with a brand new folding bike, since my previous bike was stolen on my birthday in Puerto Rico. The moorage rates here are outrages, $150 for a one night….. Then I plan fly to Seattle-Tacoma on/around the 10th. from Ft. Lauderdale, on a pass from Laura, my ex-wife. 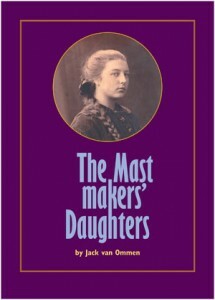 I am available for presentations of my adventures and “SoloMan” and “The Mastmakers[ Daughters” book signing. My phone is back in business 253-441-7204. 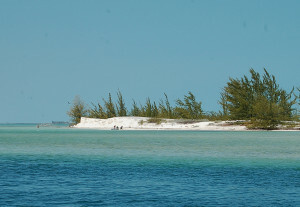 Here is the continuation of my previous blog:March 30 Off Key West, Fl. It has finally calmed down enough for me to keep the laptop on my knees, instead of bracing my self on a steep heel and constant pounding. I left Cayo Largo on Tuesday the 21st and arrived at Cabo San Antonio, the very most south west corner of Cuba on the 23rd. There was no internet there at all. I left there on Sunday afternoon, headed for Havana. Which ended up one of my worst sails ever. A strong wind on the nose. The biggest sail I could handle was the 90 percent and it is impossible to sail close enough to the wind, so, I was not going anywhere. More like going back and forth in the same place. The motor is of little use in these huge seas. While I was at Cabo San Antonio I could get the weather forecast from other sailors there. Anchoring out behind the reefs to sit out the worst of it was no option because I do trust the depth on the charts I have and I still would not have a forecast. It should have been a two night sail. Sunday was a decent sail and Tuesday during the day was o.k. but for the rest it was hobby horsing and constant sail changes. And a busy traffic lane. On Wednesday I abandoned the Havana destination. A big disappointment, but even if I could have eventually made it in, the time was running too short to get to SeaTac by the 10th of April for the family reunion and Easter. Just like prediction in the last lines of my preceding blog, the Cubans fixed my breaking bolts problem. With a pair of scissors and a discarded beer can. They carefully measured and wrapped this around the shaft to take up the wear so that the flywheel did not whobble any longer. A two man team, Blanco and Victor. Victor is a white man and Blanco a black. Blanco was telling me that there is no such thing as a racial divide in Cuba. This is quite obvious in the work place and also in social interaction. For the most part I have observed the same in most of Latin America. On Sunday, while riding my bike to the ooutskirts of the settlement on Cayo Largo, I came upon a group of young people having a little party on the water’s edge. They had a wood fire and were barbecueing conch. I always had a couple of conch shells on board, since the South Pacific, they tried to find me another one. The next day they managed to find one under the sea grass. From the photo you can see the ethnic mix. They are all working in the hotel and a couple restaurants. On Monday evening one of the young men brought me a meal from his restaurant he worked as a waiter. My German friends returned already on early Monday morning from Havana by air. So, I had a chance to say farewell on Tuesday. Cabo San Antonio is the Lands End of Cuba. The nearest town is over a hundred miles away. There is a contingent of immigration, health and customs and it is one of the few ports to clear in and out of the country. A few boats were moored alongside the pier, most of were anchored out. I had to depend on lifts in the motorized dinghies of other sailors. One of the boats on the pier was a large ketch with Victor and Cathy. Victor was born in Colombia and grew up in the States. Next to them was a 30 foot S-2 with a huge Dutch ensign. 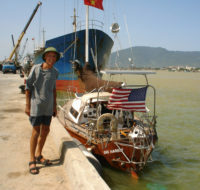 Jeffrey had bought the boat on the Florida west coast last September for $11,000 and had never sailed before. He is buddy boating with Victor and Cathy. They are now on their way to the Yucatan Peninsula. Cathy had cooked up some great dishes and the Abel the port captain was barbecuing chicken. On Saturday afternoon we had a great party. A young Spanish couple, Israel and Carolina, from Andalusia on the Belgian flagged “Takun” entertained us with their bongo and song. They are travelling troubadours, with a program of acrobatics, fire eating, etc. The health officer turned out to be a great Cuban guitar player. Last night I heard my first NPR station, since last October. The Cuban radio is now too far to hear. The Cuban radio stations all proclaim the glories of the revolution, ad nauseum. No, used car salesmen with the rolling “R”s, which gets awfully annoying on the Mexican stations. I am getting a good push from the Gulf Stream, doing close to six knots. It is actually starting to be normal sailing weather. I still cannot open the forward hatch yet. This would have been a hot and stuffy cabin in the lower latitudes. The prediction for tomorrow is for light winds from the south which should be ideal for making time in the Gulf Stream, I have enough diesel left to motor. April 1, so much for that weather forecast. It was more of the same. But I slowly got lifted to a better angle and was starting to get the benefit of the Gulf Stream. But still had to make long tacks. But then later on Friday the wind kept clocking more and more from a reach to a run. Once close to Miami I saw the SOG (Speed Over the Ground) come up to as much as 12.65 knots… Surfing with just the 90% jib. I came into Ft. Lauderdale at 8.30 pm and put the anchor down north of town at 10 pm, finally I did not have to grab a hold for every move I made in the cabin.